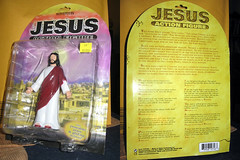 I had originally bought the Jesus action figure for the FBCDC White Elephant* Christmas Party, but Amy thought it was a bit too close to being a graven image of Deity much a trivialization of Christ by turning him into a joke and a toy, so I went back to the toy shop and traded Gliding Action Jesus for Moses with Removable Stone Tablets. It’s kind of strange that the profile of Moses on the back of his packaging is so much closer to the Biblical narrative, while the Jesus description is rather noncommittal, with quotes from such sources as the apocryphal gospel of Thomas. Action Moses ultimately ended up in Pastor Jim’s hands, while I received a little Decision Ball, which I traded with Logan for her 2006 Chinese Restaurant Calendar, from a Chinese restaurant just a block from my new office. * White Elephant: a Secret Santa style gift exchange of weird-but-useful presents where participants can opt to either (1) get wrapped gifts off the table, or (2) “steal” an already-opened gift from someone else, who must then get another wrapped gift off the table. A gift can only be “stolen” three times before it settles with the third person. 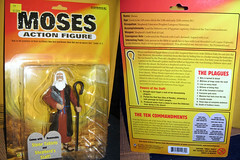 Update: I got Amy’s reasoning on the Jesus action figure wrong, so I corrected them as per her comment. Sorry, my love! The issue was actually not making a graven image, but turning Jesus into a joke and a toy. It’s terribly sad that we can trivialize Jesus. “Gliding action!” Tsk tsk!